A good wood stain can turn an ordinary wood surface into something special. It’s a great way to preserve the beautiful wood grain pattern in furniture, floors, walls, ceilings, decks, and more. Professional painters will of course stain your wooden surface for you, but, it’s also easy to do yourself, provided you have the right equipment, the right stain, and patience. 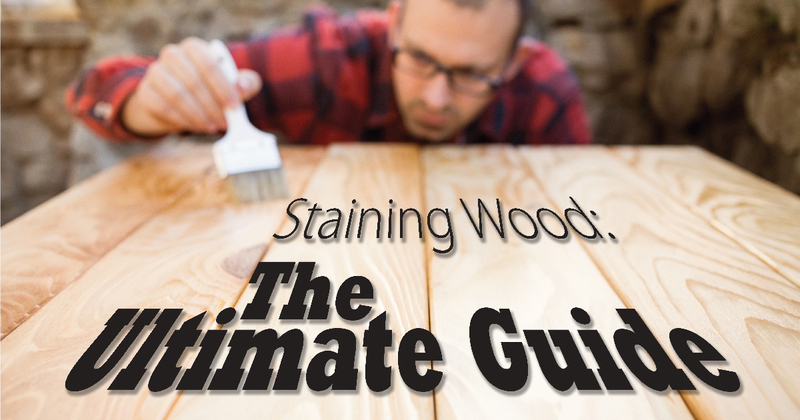 Before we jump into the step-by-step guide, let’s make sure we’re using the right wood and the right staining product. Any bare or stripped wood is suitable for a stain. You might want to stain wood if its natural color and pattern don’t match the rest of your interior or exterior design. Next, you need the right stain. Generally, stains come in two main categories: oil-based stains and water-based stains. Oil-based stains give you a longer working time, making it ideal for staining floors, cabinets, doors, and paneling. Oil-based stains also don’t raise the grain of the wood, so you shouldn’t need to do an inordinate amount of sanding. Water-based stains dry faster, have less of an odor, and only require water and soap for clean-up. Water-based stains also tend to come in a wider range of hues. Before you apply any stain to any surface, you should sand the wood to open its pores and allow the stain to take hold. Most surfaces will require a medium-grit sandpaper first, then a small-grit sandpaper to finish. Sand in the direction of the grain to avoid scratches. When it comes to brushes, stains are flexible. You can use a bristle brush, a foam brush, or a cloth, depending on the surface you’re staining. Work the stain into the pores by rubbing and brushing it against the grain. Err on the side of too much stain on the brush so that the wood absorbs as much of it as possible. Once applied, you can play with the color and finish of the stain by allowing it to sit on the wood. The longer you let a stain sit, the deeper and richer the color will be. When you have a good color, use a cloth and wipe the excess stain from the surface of the wood. Don’t let this excess stain dry on the wood, it will prevent the clear finish from adhering to the wood. When you wipe off your surface, wipe with the grain to avoid swirl marks and other mistakes in the finish. When choosing your stain, you can look for thicker consistencies that will cling better to vertical or upside-down surfaces without immediately drying, letting you take your time to apply an even coat. Stains provide deep, rich, natural colors to wood, but not all of them offer protection from natural elements. Make sure the stain you use has a clear finish included, or put on a layer of clear finish when you’re done staining. Popular types of wood for staining include oak, poplar, pine, and hard maple.